Here are some observations as I installed BW8 for the first time yesterday. The only things in the box are a Quick-Start Guide and the DVD. Having used the six pack of CDs in the past, the DVD is a huge improvement. I will run through the steps I took, but the Quick-Start Guide is helpful. It is short enough that someone will probably be tempted to read it! In addition to the installation instructions, it gives a quick orientation to the program that one really should read if you have not used the program before. You will see that if you have been using BW7, most things work as you expect in BW8. There was a major interface change from BW6 to BW7, but this worthwhile upgrade mainly features enhancements and new databases and tools. The whole installation process took me less than 30 minutes, but a big chunk of that time was taken by the two reboots. Before starting the installation, just to be safe, I backed up the following BW7 subdirectories: ase, databases, downloads, init, notes, userdb. I went ahead and rebooted, installed the DVD, and proceeded following onscreen cues. When it came to activating modules, I entered the code that is on the front of the Quick-Start Guide. I had previously received via email the new codes for modules I had purchased. (BDAG, HALOT, CROY) By copying those codes in the email and then simply returning to the code activation menu, the codes were automatically pasted in. Very nice. 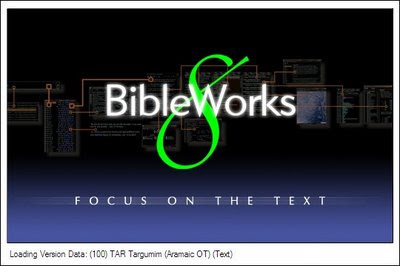 The following list of databases contains items included in the base package of BibleWorks 7 which are no longer available from BibleWorks and which will not be included in the BibleWorks 8 package. The following list of databases contains items included in the BibleWorks 7 base package which are no longer available in the BibleWorks 8 base package, but which may be purchased separately. 4. A Concise Greek-English Dictionary of the New Testament, Barclay M. Newman, Jr.
5. A Textual Commentary on the Greek New Testament, Bruce M. Metzger. 6. Greek-English Lexicon of the Septuagint, Lust-Eynikel-Hauspie. 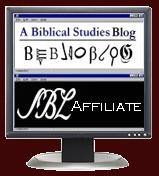 If you are a registered user and are upgrading from BibleWorks 7 to BibleWorks 8, you will be sent free of charge a set of activation codes for items 5 and 6, and registered users upgrading from BibleWorks 7 or previous versions will be sent free of charge a set of activation codes for items 3 and 4. Another reboot; everything set, so I start the program... First appears the splash screen, and it turns out that there are at least 6 different ones. (Still looking for those tater tots!) The Getting Started screen appears, and if you are new to BW, then looking at the short videos surveying the program are really worthwhile. there's a new, bluish button on the button bar that is the new ERMIE feature. I ran a few simple tasks, and everything runs as expected and as fast as ever. I'll post this for now, but in the next one, I will describe all the steps ones needs to take to migrate from BW7 to BW8, especially if you had customized BW7. Biblical Art... in Google Earth! ?